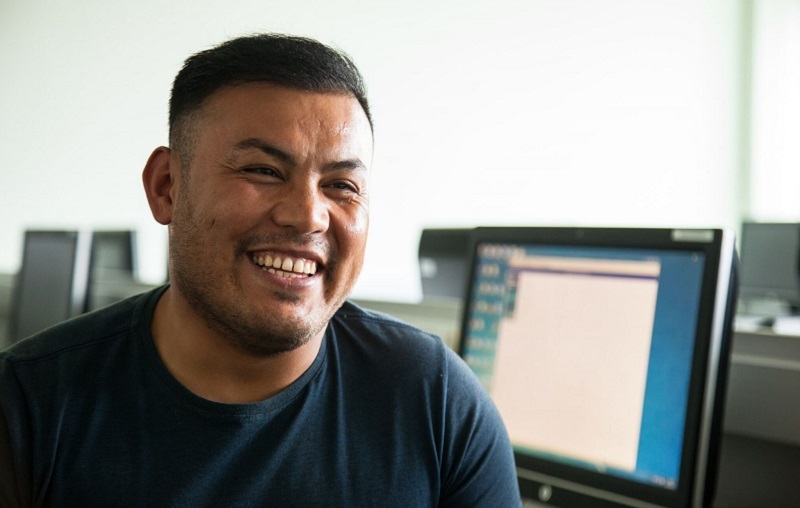 A refugee who fled Afghanistan alone at the age of 16 has been crowned ‘outstanding individual learner’ at this year’s Festival of Learning awards. The Royal Society of Arts in London will be the setting for today’s prestigious awards ceremony at which nine learners, employers and training providers will be singled out for their “inspirational” lifelong-learning stories. Among them will be Habib Rezaie (pictured above), who arrived in the UK as an unaccompanied asylum-seeker 10 years ago. He was taken into care by Leicester City Council, and didn’t speak a word of English because he had not attended school in his home country. Judges pointed out that Mr Rezaie was forced to work long hours to catch up with his peers – but his hard work paid off and he earned a place on Leicester College’s ICT course. After that, he eventually achieved a 2:1 in his degree in business computing at De Montfort University. Alongside his studies, Mr Rezaie volunteers at After18, a Leicester charity which supports unaccompanied asylum seeking children and young people. “Education is the most important thing in my life as it gives me hope for the future and allows me to make a positive contribution to my community,” he said. The Festival of Learning, led by the Learning and Work Institute with support from the NOCN, is now in its 25th year. Jonathan Beebee will be presented with this year’s ‘learning for work award’. He sustained a severe head injury at 19, and was told he would never fully recover. But defying the doctors’ verdict, he pushed on and enrolled into the Lloyds Bank Social Entrepreneurs programme at the School for Social Entrepreneurs in Hampshire. Twenty years on he runs a social enterprise called PBS4, which supports people with learning disabilities. Mark Goodwin will meanwhile receive the ‘social impact award’. Judges claimed his “determination” to include all types of learners in his sports classes led him to establish England’s first mixed-ability rugby team, and inspire many more across the country. Under the inclusive model, players with learning difficulties and physical disabilities play full-contact rugby alongside their able-bodied peers. The ‘project award’ goes to Refresh 2 Impress, a bespoke three-day course designed by South Gloucestershire and Stroud College “tailored for learners over 50 years of age”. More than 300 adults have benefited from the opportunities this learning presents, according to the judges. Sabeena Shah will pick up this year’s ‘tutor award’. The judges said that when growing up, Sabeena was “not encouraged to study, let alone think about teaching”, but when she graduated with a law degree in 2011, she decided to teach students facing similar challenges. Sabeena now manages and teaches the access to law level three qualification at Barking and Dagenham College. Taylor Bird will be given the ‘young adult learner’ award. Bullied at school due to learning and physical disabilities, she left with very few GCSEs. But she “flourished” at Walsall College and worked hard to complete entry-level English and maths qualifications as well as level two and three art and design. She won a place on a photography degree and has now set up her own photography business with plans to expand into her own studio. Picking up the ‘employer award’ will be James Electrics Contracting, which works closely with local training providers in Devon to offer “high-quality work experience opportunities for learners”. It offers training to nine apprentices, trainees or work-based learners each year. Talk English, a project which helps people with poor English skills improve their spoken and written communication and become more involved in the community, will be handed the ‘president’s award’. And Stephen Bush will be honoured with the ‘patron’s award’ after he took early retirement from a long career in social services to become his mother’s carer. He is now a “passionate advocate of adult learning, believing it can play an instrumental role in staving off dementia”. Anne Milton, the skills minister for skills, said it was “such a pleasure to be able to congratulate this year’s Festival of Learning award winners”.